In the world of Kangaroos, there is little doubt that the Red Kangaroo is the boss, being the largest of all at a height that rise to over five feet or 1.6m. This animal plays the leading role in this Lightning Games designed slot and is joined by male and female beach bums, a trusty dog and a pair of parrots on the reels. With 1,024 ways to win on every spin and a free spins bonus round with a potentially massive multiplier, there is a lot to enjoy about this game. Players outside of the US can find this slot (and claim 50 free spins, though on a different jackpot game!) at the amazing Unibet Casino – see www.unibet.com for details. Red Roo is a five-reel slot, with each of the reels is four symbols high when they stop spinning. This game utilises the all ways winning system, meaning that you’ll win when landing symbols on consecutive reels, as long as there are no gaps. This gives you 1,024 ways to win on every spin. The highest paying symbol of all is the Red Roo (kangaroo), which pays 250 coins for hitting the maximum five in a row. This symbol is stacked at times, meaning some large multi-line wins are always possible. The male and female beach bums each have a top prize of 200 coins, while a puppy with a stick in its mouth and two pink parrots are each worth 150 coins. The standard symbols are completed by the playing cards 9, 10, J, Q, K and A. The wild symbol is represented by a red rock mountain and this will substitute for every other symbol in the game apart from the scatter. This wild will appear on reels 2, 3 and 4 only. With 1,024 ways to win, a single wild symbol can lead to a large number of additional wins. This wild really comes into its own during the free spins feature. The feature in the Red Roo slot is a free spins bonus round. This is activated by hitting three or more Australia scatter symbols across any of the reels, these symbols showing Australia as it looks on a map. Hit three scatters and you’ll win 80 coins and 8 free spins, hit four scatters and 400 coins as well as 15 free spins are yours, while the maximum 5 scatters pays 800 coins and you’ll earn 20 free spins. During these free spins, the wild symbol plays a much larger role than usual. When a wild lands it will have either a 2x or 3x multiplier attached and these wilds can work in combination. For example, you might land a win with a 2x wild multiplier on reel 2 and a 3x wild multiplier on reel 4, meaning your total win amount is multiplied by 6. The maximum multiplier in the game is x27, when you land three consecutive 3x multipliers. There is another added advantage to the feature too in the fact that retriggers are much easier than usual. Land 3, 4 or 5 Australia symbols during the feature and 8, 15 or 20 spins are added to the spin total, while hitting just a pair of the scatter symbols will see 5 spins added. Red Roo is set against the backdrop of an Australian outback scene, with red rock mountains in the distance and wisps of grass on the plain in the foreground. The oversized reels sit in the center of the screen and these have a dark blue background. Each of the symbols bring a nice splash of color to the reels, while there is some impressive animation too, especially with the top paying Red Roo symbol, which hops around before facing out from the reels. At the start of the game you’ll be asked if you want to play with sound and if you do, you’ll enjoy a range of noises from the outback, including many animals and a didgeridoo of course. This is a very enjoyable slot from Lightning Games. With 1,024 ways to win during every spin, the action is exciting from the start, and the game only gets better when you land the feature. With wild multipliers in place, a seemingly small win can become a huge and with the easy retriggers, this feature could run and run. 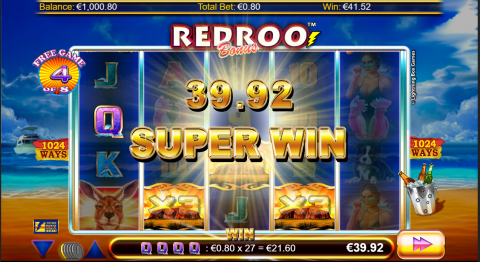 Red Roo is one of those slots to add to your ‘must-play’ list.